Hello everyone! This is Direwo... wait, no... But, since I've caught your attention now, I'd like to show you a mod that I've been creating for some time now. The Mod is called OpenGlasses ans is an extension to OpenComputers.It is analogous to glasses from the OpenPeripherals add-on for ComputerCraft, but adds a few more nifty features. 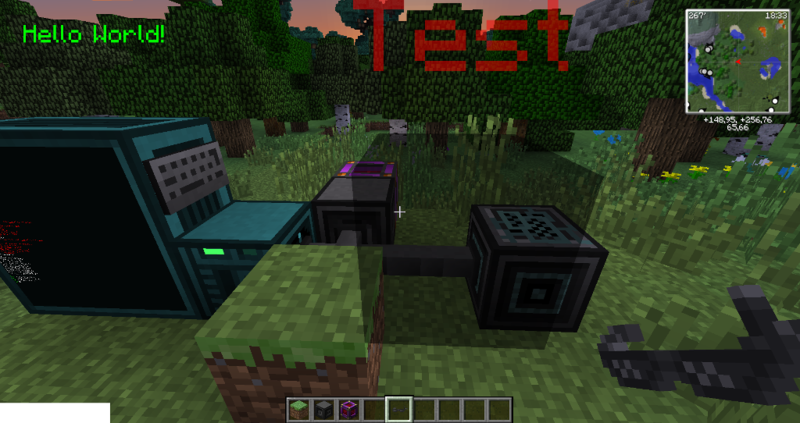 OpenGlasses is a mod which adds Augmented Reality features to Minecraft. You can render objects, like shapes and text both in the world and on the players HUD, only visible to those with the Open Glasses on (think Google Glass, but in blocky form). Hey, is there a way to determine the players XYZ position in the world? The information should be included in the output. Mainly want this so I can make information automatically pop up on screen with a bit of animation when a player walks up to something. On the off chance I've been looking for the wrong thing, could you let me know? Cheers. Terrible description. What does it do? That's... still not super helpful but the new image in the description clarifies it! Unable to go to Wiki page. "Invalid Certificate"
It should run in 1.12.2 fine. oops, it was another mod that caused the crash. Thanks^^. Is there a way to determine the screen size for use with the flat overlay? If not, could this be added to the terminal somehow? I have your mod together with a mod called Blur, it kind of explains what it does. But there is a feature where you can blacklist certain GUI:s so it won't active while in that GUI. The keybind that frees the mouse while having the glasses on is handled like a GUI. I was wondering if you could say the unique ID for that GUI, I have been looking around for a way to get all GUI ID:s. But there seems to be no answer for that. I found it. It's: "com.bymarcin.openglasses.gui.InteractGui". So theoretically, I could take the vertex data from a .obj file and use it to render the model using individual triangle objects? Could you provide some examples or a tutorial? I'm having a rather hard time with this.